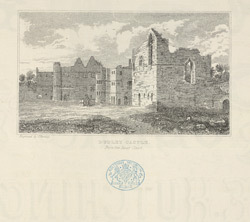 Dudley Castle was built in 1071, and underwent many changes over the following centuries. The original construction was of wood but it was rebuilt at different times until 1750 when a devastating fire gutted the castle. The castle had begun to deteriorate and locals did nothing to put out the fire as a legend held that gunpowder was stored within the castle. Throughout the 19th Century the castle was used as a venue for festivals and fetes. Page 2 of the music sheets has a small engraving of the castle from the inner court.